It's that time of year. The time in late summer when fairs are in full-swing all across America. Sure, it's fun to go see the animals, hit the cheesy rides, and people watch, but let's face it, most folks go to spend too much money on incredibly unhealthy yet delicious food. Each year I'm amazed at what the fair food purveyors are slinging. I think that if your wares can be fried, dipped, frozen, roasted, served in a cup, on a stick or in some form of bread, you're approved to vend. Even better, go for any two or more of the above and you're in seriously tall cotton. If you ask me it's gotten seriously out of control. Deep-fried butter on a stick? Really?! One of my all-time favorite fair staples, at least at the fairs that I've been to, is the onion burger. It's very simple and decadent without going too far over the top. Just take an ordinary quarter-pound burger, cook it on a flattop, then top it with cheese and a ridiculous amount of sauteed onions and serve it on a bun that is just a little too small. Done. Here's my backyard version of this run-down-your-arm masterpiece. 4 large Yellow sweet onions, chopped to 1/2"
Form the meat into eight equal-sized balls (1/4 lb each). Flatten each ball of meat between wax paper to about 1/4" thick and about 5" in diameter. Stack the wrapped burgers in a gallon zip-top bag and freeze until you're ready to grill. Heat a large heavy pan over medium-high heat, then add the oil. Add the onions, and half of the salt and pepper, then saute until the onions are translucent and just starting to brown, about 15 minutes. 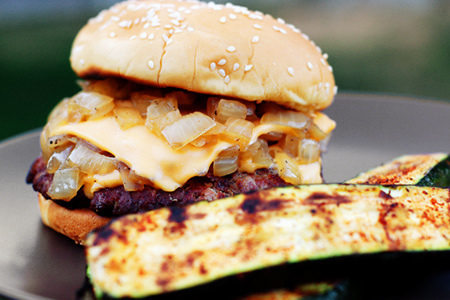 While the onions are cooking, start your grill and prepare for direct grilling at medium-high heat (350-375º). Add the Worcestershire to the pan, stir well, and cook another minute. Cover the pan, remove from the heat and set aside. Season one side of the burgers with the remaining salt and pepper. Grill each burger for about two minutes per side then top each with a slice of cheese, 1/4 cup of onions, another slice of cheese, and another 1/4 cup of onions. Move the burgers to one side of the grill and quickly toast the buns on the other side. Gently slide each burger onto a bun and serve with your side of choice. I served mine with slabs of grilled zucchini. I agree with you about the food at fairgrounds... total garbage! This is a keeper of a recipe! I love all those onions! Yum... I'm going to make that. We don't have burgers like this at our fair but these look elbow dripping good. It's true, things are just outrageously overprized at those fairs. I love your 'backyard version" and it sounds pretty... eeeerrhhm... 'authentic'. Yum! I love spiders! This recipe is going to the top of my list of recipes to try out. Thanks for the great find.